Tackling our carbon footprint is one of four pillars of our climate change strategy (see Focus: Climate change). In 2007, we launched the COyou2 Programme because we wanted to make our commitment more tangible for our employees and help them to become more aware of climate change. The programme offers subsidies for a range of investments through which our employees can reduce their private carbon footprints. To our knowledge, it was the first global corporate initiative of its kind at the time. The investment options we offer for subsidies are clearly specified in the programme. Some of them are supported at all our locations, while others vary to account for regional differences in climate, living conditions etc. Our subsidies cover 50% of the investment amount up to a locally determined maximum allowance. All regular employees are entitled to apply and new employees can submit subsidy requests after three months following their hire start date. In 2017, we granted a total of 2 528 subsidies spread across three product categories: home appliances, home infrastructure and mobility. Over the past four years, electricity-powered mobility has become more prominent, with 555 subsidies for e-bikes, e-motorbikes, e-cars and plug-in hybrid electric cars. 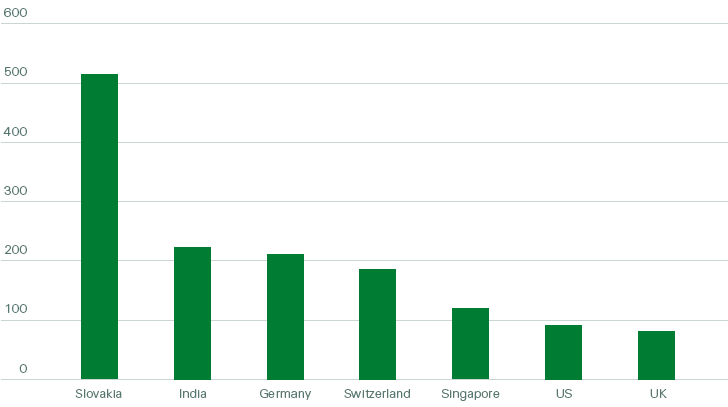 Amongst the larger Swiss Re locations, uptakes per employee were highest in Slovakia and India. Our office in Slovakia has witnessed particularly strong growth in recent years. Many new employees there have made use of the opportunity to claim subsidies, eg for highly energy-efficient fridges and washing machines as well as bicycles for their daily commute to work. In Europe, in general, mobility remains a popular category, with bicycles the most common type of subsidy. In our Asian locations, energy efficient home appliances were particularly popular. In the Americas region, both home appliances and home infrastructure subsidies were sought-after subsidy categories.